There are many psychological, social and biological benefits of eating meals with other people. Sharing mealtimes is good for your mental health. Whether it be through sharing experiences with family and friends, winding down with company, bonding with family members or just having someone to talk to, mealtimes provide a great opportunity for us to set aside a specific time of the day or week to give us time to socialise, relax and improve our mental health. 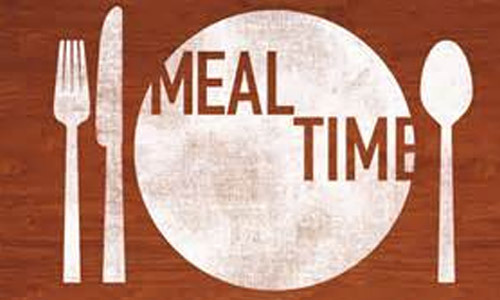 Regular mealtimes which are shared provide a sense of rhythm and regularity in lives. They offer a sense of containment and familiarity, and can evoke deep feelings of contentment and security. Humans need structure and routine. Mealtimes offer people the opportunity to stop, to stand still psychologically, to reflect on their day and days ahead, and to listen to and interact with others. Mealtimes are also a grounding opportunity, a time when anxieties can be expressed and you can be listened to. Sharing meals helps to develop social skills in children. Children learn from behaviour modelled by parents and older siblings. Mealtimes provide an opportunity where children and adolescents can learn to listen and learn how to interact in conversation. The ritual of the shared meal continuously reinforces individual identity: who he/she is, where does he/she belong or what his/her role might be. Qualities such as empathy and understanding can be developed as views and perspectives other than one’s own can be discussed. Importantly, mealtimes make people feel connected to others. Regular mealtimes are good biologically. They provide rhythm and make us stop and focus on eating in upright chairs which improves digestion. The act of talking and listening also slows down the eating process. Set achievable goals. Choose at least one day every week which is set aside for sharing a meal with family or friends. This should be an event which is an honoured and routine part of every week, whether it’s over a leisurely breakfast , dinner on a Friday or lunch on Sunday. Make sure everyone is involved, both in deciding the day and in making sure it’s kept free. When planning the meal try to choose something that is tasty but relatively simple and easy to prepare. This will ensure that the tradition continues and doesn’t become a chore. Get others involved in preparing for the meal: someone to decide on what will be served, someone to do the grocery shopping, and decide who will set the table, do the cooking and who will do the dishes. Rotate these tasks. Planning meals in advance will save time in the long run and provide an opportunity to put a little more thought into introducing a variety of interesting dishes into mealtimes. Ask others for input into meal planning. If you have children, over the course of time get them involved in all aspects of mealtime preparation from menu planning, to cooking, to doing the dishes. Try to use the opportunity mealtimes provide to talk and share. A television on during a meal will be distracting, even if its only in the background. Across the globe there many different mealtime cultures, each with their own advantages. By looking at other cultures’ mealtime practices we can learn how to improve our own shared mealtimes. The Mediterranean and Japanese mealtime culture can offer us some valuable lessons. The Mediterranean diet involves eating lots of vegetables, seafood, fresh herbs, garlic, olive oil, cereal and grains. It is widely acknowledged that Mediterraneans may live longer and healthier lives due to their diet. Dinner in Mediterranean countries such as Italy or Greece is usually a big affair that is taken seriously. In some countries it is usual to start quite late in the evening. For example, in Greece, aperitifs often begin around 8 or 9pm with dinner at 10pm. Having meals in this slow and relaxed manner amplifies the social nature of the meal, and its associated benefits. In Italy, lunch is seen as the social meal of the day, as children do not go to school in the afternoon and many small businesses close in the early afternoon. Therefore there is plenty of time to relax and enjoy the luxury of several courses. Japanese cuisine centres around rice, noodles, soy products and a variety of vegetables and fish – therefore it comes as no surprise that Japan is considered as one of the world’s healthiest nations. Japan is widely known for its tea ceremony, the Chado. This is a very formal, yet spiritual and relaxing ritual of the preparation and serving of powdered green tea. The ritual is designed to bring aesthetic, intellectual and physical enjoyment, and peace of mind to the guests. The important thing to remember is that although the ceremony may sound like it is carried out for the personal enjoyment of guests, the underlying reason for conducting the ceremony is to increase appreciation of the beauty of nature such as the sound of water and light. Therefore, drinking tea together symbolises intimacy, equality and tranquillity. Importantly, it calms the mind. In Japan, people also tend to share a number of dishes rather than eating only from their own plate, which makes the meal a more social affair.